Advent started this past Sunday. I had meant to have this finished and posted by then but life got in the way. 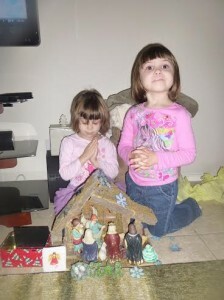 Anyway, this year I wanted to do more to celebrate Advent with the girls as we prepare for the coming Christmas season. 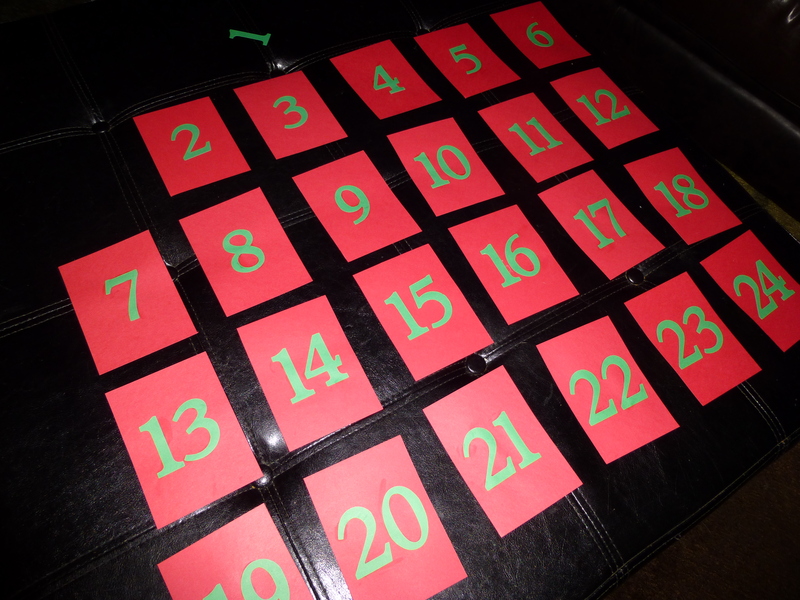 Towards that goal I made our own Advent calendar with activities to celebrate the season. This was super simple. 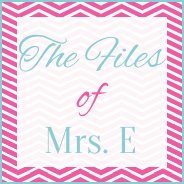 I cut red cardstock into rectangles (mine were 3.5″ by 5″). 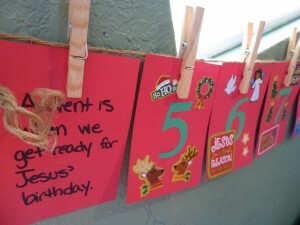 I debated using the colors of the Advent candles, but decided to wait until the girls were older to add in that aspect. So the tabs were red and then I cut the numbers out of green using my Cricut. You could just as easily use number stickers or write them by hand. Advent is when we get ready for Jesus’ birthday. God loves you so much! He is always with you! 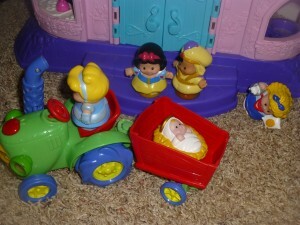 Buy toys for those who won’t get any at Christmas. Say a special prayer for someone who needs extra help. 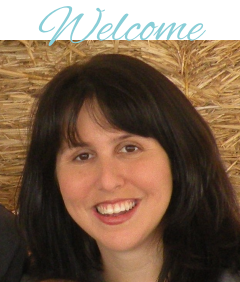 Go to church with your family. 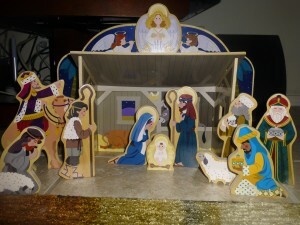 Help make Christmas presents today. Be extra nice to your sister today. Learn a new Christmas carol today. Help feed and take care of Hero. (Our dog, this is a chore they haven’t done before). 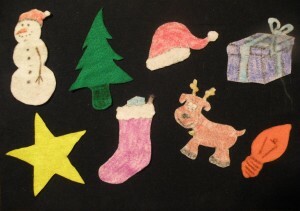 Draw a special Christmas picture. 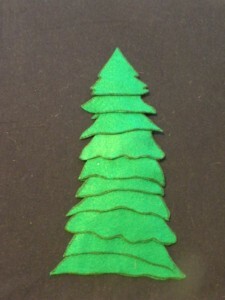 Do a Christmas craft today. 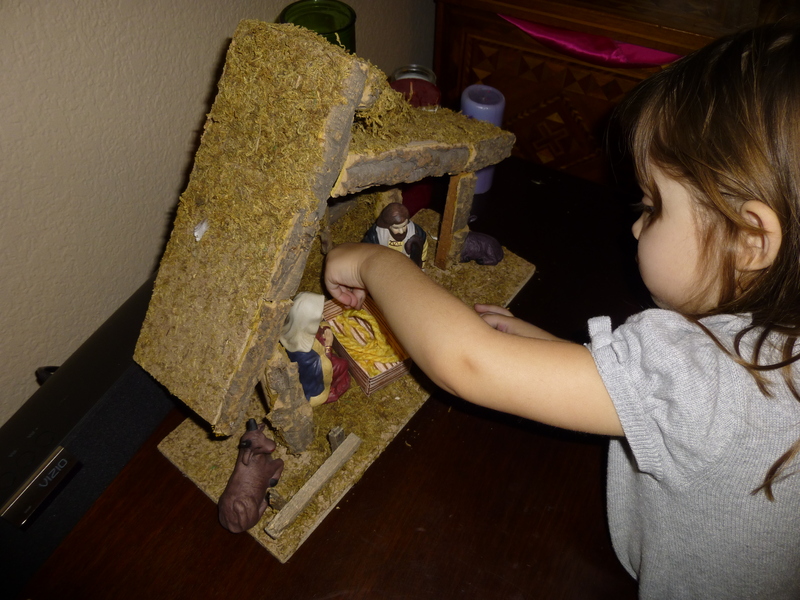 Tell a family member the story of Jesus and the first Christmas. (For the Immaculate Conception) Say a special prayer to Mary today. 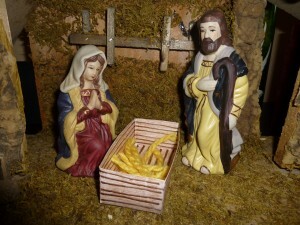 (On Christmas Eve) Happy Birthday Jesus! Sing Happy Birthday to Baby Jesus! The girls love Christmas trees so much this holiday season that I decided to do a little mini-theme on them, inspired by the classic Mr. Willowby’s Christmas Tree by Robert E. Barry. 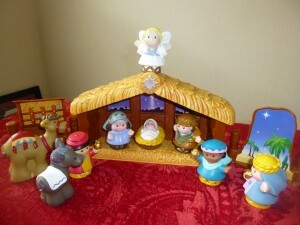 In the story wealthy Mr. Willowby gets a huge tree that doesn’t fit in his house so he cuts off the top. The top is passed along where once again it is too big and the top gets chopped. Mr. Willowby ends up providing many with a Christmas tree, including the maid, the bears, and the mice. We did felt board stories, learned about the life cycle of a tree, sang songs, and even made our own little trees, all leading up to decorating our family Christmas tree. We actually spread the everything out over two days, setting up the tree the first day and actually decorating it the second after all of our activities.. I cut out 10 fir trees out of green felt with the trees starting small and getting progressively bigger. 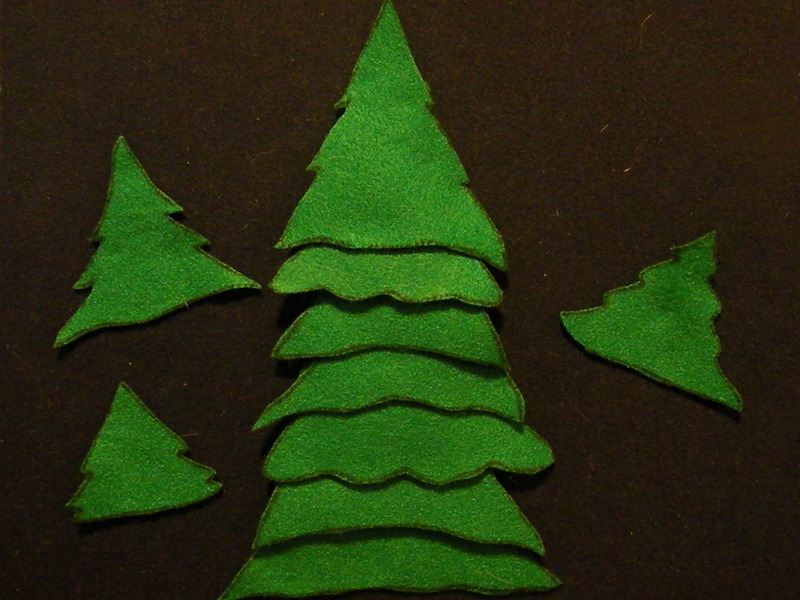 I then layered the trees on the felt board to make one big tree. As we read the following poem, we would take a tree off of the big one and add it to the board so that the number of trees would grow out of the bits of one tree just like in Mr. Willowby’s Christmas Tree. One merry, two merry, three merry Christmas trees, Four merry, five merry, six merry Christmas trees, Seven merry, eight merry, nine merry Christmas trees, Ten merry Christmas trees there. Ten merry, nine merry, eight merry Christmas trees, Seven merry, six merry, five merry Christmas trees, Four merry, three merry, two merry Christmas trees, One merry Christmas tree there. 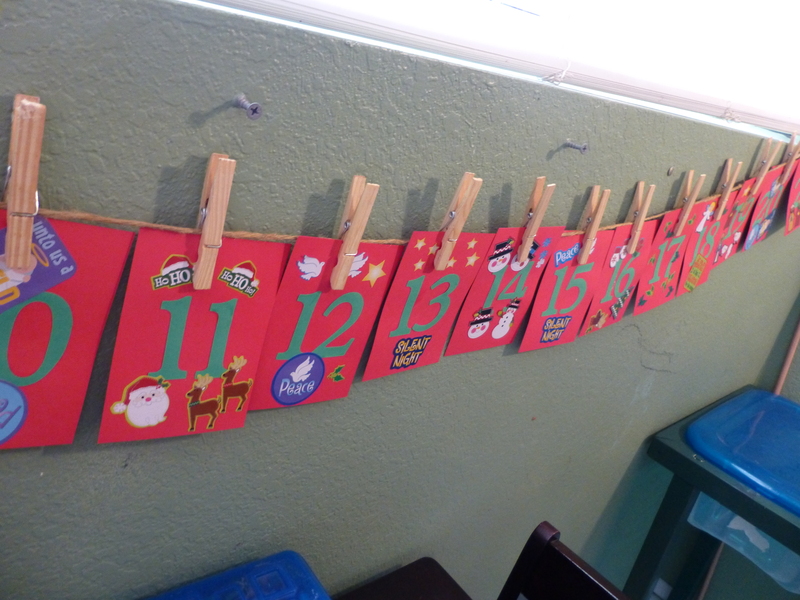 Ahead of time, I printed out pictures of the different stages for a fir tree–seeds, sprouting, seedling, full grown, pine cone–and mounted them on construction paper. The girls and I went through each card talking about what a tree was doing, really focusing on seeds and pine cones. The second day we actually pretended to be trees, starting curled up in a ball as a seed and then growing big and tall. It was a little silly but the girls thought it was funny. 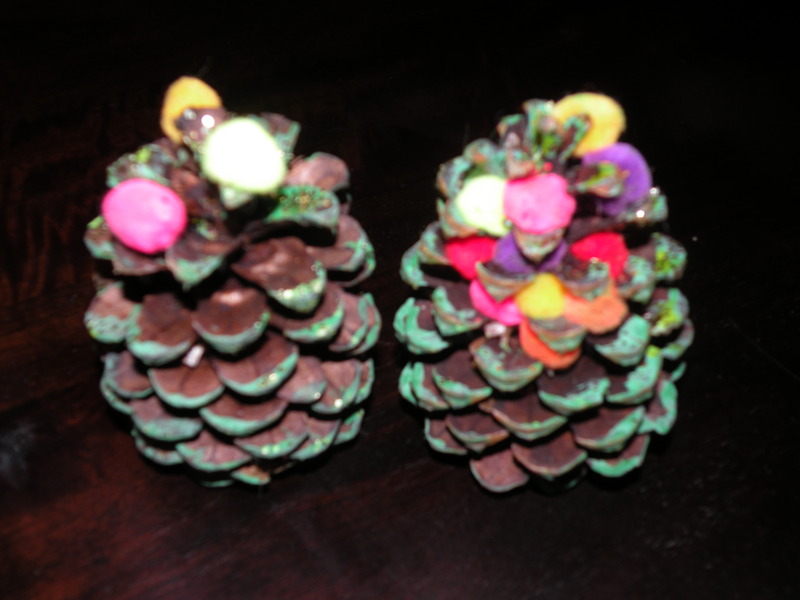 We also made our own little Christmas trees out of pine cones (I remember doing this myself when I was little). 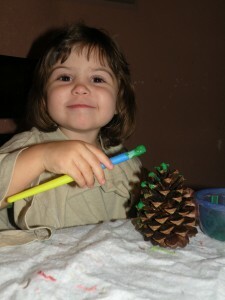 First the girls painted the pine cones green, next sprinkled them with glitter, and then glued pom poms on as ornaments. As we live in the desert, pine cones are hard to come by. I just picked some up at Michael’s. They are the scented ones but that just added some extra Christmas cheer to the house. When starting our activities we talked about where Christmas trees first started, looking at Germany on the map. If you don’t have a globe or map, you can find great maps here. We also colored sheets on T is for Tree and practiced the letter T using some of the worksheets found here. And we sang the song “Oh Christmas Tree.” To round off our theme, we cut our peanut butter sandwiches in the shape of a Christmas tree with a cookie cutter. 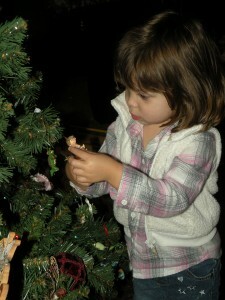 Finally, we were ready to decorate the tree! I came up with this felt board activity based on the classic Brown Bear, Brown Bear, What Do You See? by Bill Martin, Jr. 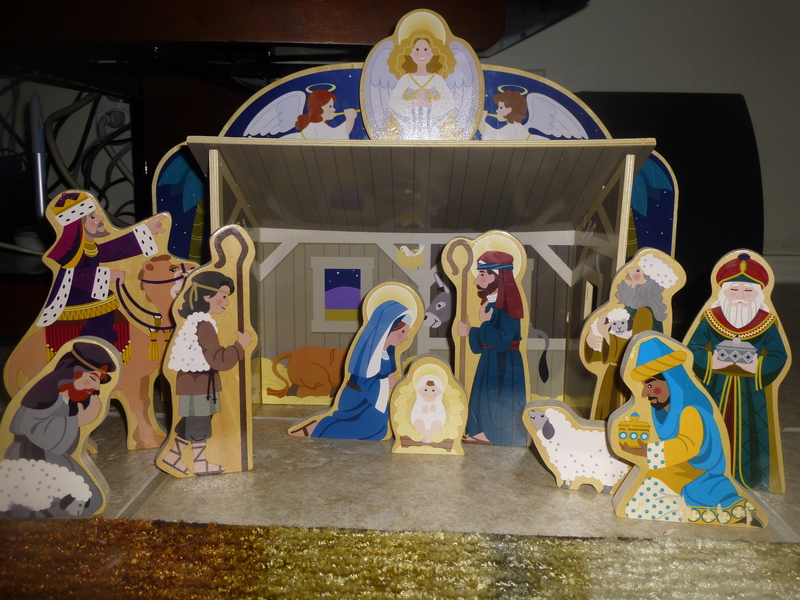 It follows the same rhythm but uses colors and images from the holiday season. White Snowman, White Snowman, what do you see? I see a green tree looking at me. Green Tree, Green Tree, what do you see? I see a red hat looking at me. Red Hat, Red Hat, what do you see? I see a blue present looking at me. Blue Present, Blue Present, what do you see? Yellow Star, Yellow Star, what do you see? I see a purple stocking looking at me. Purple Stocking, Purple Stocking, what do you see? I see a brown reindeer looking at me. Brown Reindeer, Brown Reindeer, what do you see? I see an orange light looking at me. Orange Light, Orange Light, what do you see? I see _(Child’s Name)_ looking at me. _(Child’s Name)_, _(Child’s Name)_, what do you see? I see a white snowman, a green tree, a red hat, a blue present, a yellow star, a purple stocking, a brown reindeer, and an orange light looking at me. Like most of our felt board activities, the first time we did this, I recited the poem and placed the pieces on the board. When we went through it a second time, I tried to get the girls to say it with me as we pulled out pieces and put them on the board. Ed drew the images for me, which I have included below. You can cut silhouettes from colored felt or draw/trace images on pellon to color in with oil pastel crayons.